Sussex Police has re-issued an appeal to identify a man sought in connection with the theft of a doctor's purse. A spokesman said: "On the morning of January 8, a man entered Riverbank Medical Centre in Dodsley Lane, Midhurst, and stole a doctor’s purse and bank cards. "A similar incident occurred at a medical centre in Leatherhead, Surrey, on December 9, and on both occasions the stolen cards were used to spend approximately £30,000 in a single day on men’s watches and clothing." Police believe the two incidents are linked and said it 'may form part of a wider series of offences beyond Sussex and Surrey'. 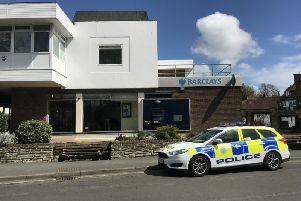 After leaving Riverbank Medical Centre, the thief used the bank cards at jewellers, clothes shops and a currency exchange premises in Chichester, Brighton and Goring, according to police. Detective Constable Ceri Spratt said: “We are seeking assistance in identifying the man pictured in connection with both incidents. The suspect is believed to have links to Birmingham, police said. Anyone who recognises the man, or who has any further information, is asked to report it to police online or by calling 101, quoting serial 1179 of 08/01.